Does your bathroom feel a bit too pristine? Are you looking for a few ways to liven things up and maybe stir up some controversy? While it's probably not a great idea to renovate or remodel a shared bathroom without giving your family or housemates a heads up first, there's no reason why you can't instill a spark of debate or (light) debauchery in your loo. Consider these mostly friendly and occasionally dispute-inspiring choices for your home's restroom. As everyone knows, one the best features of public restrooms is the graffiti. While this is potentially the worst feature of a home restroom - usually the fault of a 5-year-old with a crayon - with a little guidance and style, you can turn your bathroom wall into the sweetest and coolest graffiti center there is. Using decals or specialized wallpaper, designate a framed area in which guests who stop by the bathroom can leave a quick message or just sign their names. Hang a Sharpie nearby for exactly this purpose - but make sure you remind them to wash their hands before picking it up! Grab yourself a basket for the back of the toilet or install some shelving, then head out to the used bookstore and pick up some cheap, controversial classics. From Catcher in the Rye to The Adventures of Huckleberry Finn or your favorite banned book series, keep some of these around to add character and provide some reading material if the need occurs. What better place is there to raise some hell than on Twitter, where you're limited to 140 characters and 90 percent of your followers are sure to misinterpret what you write. Why not post that day's most trending controversial Twitter topics to the back of the bathroom door? Whoever's reading it is sure to fire up his or her iPhone and get in on the debate. Of course, with all this edgy content in your bathroom, you'll want to keep things at a relative level of decorum and class for stylish contrast. That's precisely what your fixtures are for! 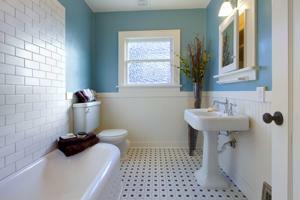 Consider investing in gorgeous new bathroom faucets or a stylish vanity to bring out the best in your space.